15643 ND SIERRA LEONE (1980) Nigerian blue-breasted kingfisher (Halcyon malimbicus forbesi)*. Imperforate pair. Scott No 472, Yvert No 435. Only one sheet of 10 imperforates was issued! 57 ND SIERRA LEONE (1990) Aardvark (Orycteropus afer)*. Imperforate. Scott No 1261f, Yvert No 1232. Only one sheet of 10 of each was printed imperforate! 58 ND SIERRA LEONE (1990) Pygmy hippopotamus (Choeropsis liberiensis)*. Imperforate. Scott No 1261h, Yvert No 1234. Only one sheet of 10 of each was printed imperforate! 108 ND SIERRA LEONE (1990) Royal antelope (Neotragus pygmaeus)*. Imperforate. Scott No 1261g, Yvert No 1233. Only one sheet of 10 of each was printed imperforate! 125 ND SIERRA LEONE (1990) African elephant (Loxodonta africana)*. Imperforate. Scott No 1261n, Yvert No 1240. Only one sheet of 10 of each was printed imperforate! 592 ND SIERRA LEONE (1990) Sacred ibis (Threskiornis aethiopica)*. Imperforate. Scott No 1261j, Yvert No 1236. Only one sheet of 10 of each was printed imperforate! 593 ND SIERRA LEONE (1990) Darter (Anhinga melanogaster)*. Imperforate. Scott No 1261l, Yvert No 1238. Only one sheet of 10 of each was printed imperforate! 594 ND SIERRA LEONE (1990) African spoonbill (Platalea alba)*. Imperforate. Scott No 1261r, Yvert No 1244. Only one sheet of 10 of each was printed imperforate! 595 ND SIERRA LEONE (1990) White-backed night heron (Gorsachius leuconotus)*. Imperforate. Scott No 1261b, Yvert No 1228. Only one sheet of 10 of each was printed imperforate! 596 ND SIERRA LEONE (1990) Marabou stork (Leptoptilos crumeniferus)*. Imperforate. Scott No 1261d, Yvert No 1230. Only one sheet of 10 of each was printed imperforate! 597 ND SIERRA LEONE (1990) White-faced whistling duck (Dendrocygna viduata)*. Imperforate. Scott No 1261e, Yvert NO 1231. Only one sheet of 10 of each was printed imperforate! 792 ND SIERRA LEONE (1990) Leopard (Panthera pardus)*. Imperforate. Scott No 1261i, Yvert No 1235. Only one sheet of 10 of each was printed imperforate! 793 ND SIERRA LEONE (1990) Golden cat (Profelis aurata)*. Imperforate. Scott No 1261a, Yvert No 1227. Only one sheet of 10 of each was printed imperforate! 5772 ND SIERRA LEONE (1990) Queen Mother 90th birthday*. Imperforate strip of 3. 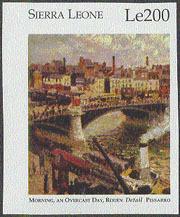 Scott No 1255a, Yvert Nos 1211-3. Only one sheet of 10 of each block was printed imperforate! 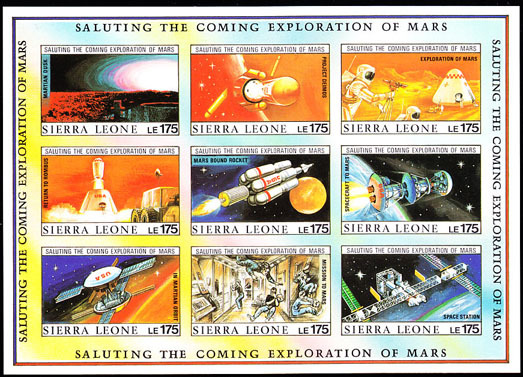 17283 ND SIERRA LEONE (1990) Saluting the coming exploration of Mars, sheet 1. Imperforate M/S of 9. Scott No 1167. 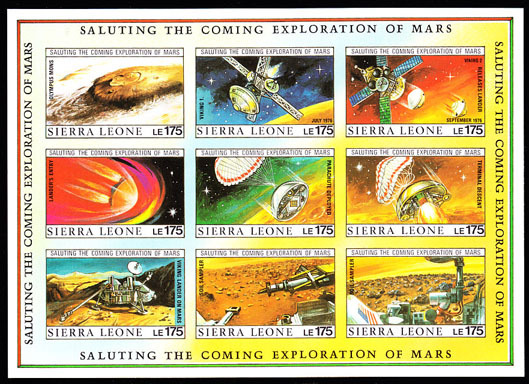 17285 ND SIERRA LEONE (1990) Saluting the coming exploration of Mars, sheet 2. Imperforate M/S of 9. Scott No 1168. 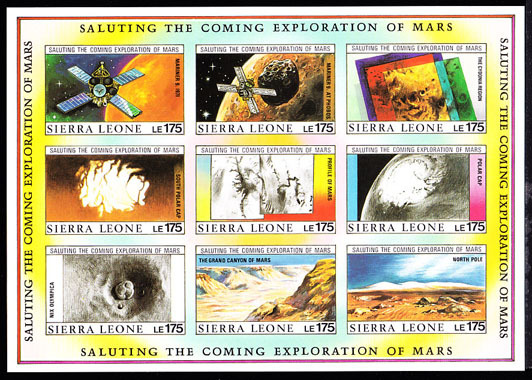 17286 ND SIERRA LEONE (1990) Saluting the coming exploration of Mars, sheet 3. Imperforate M/S of 9. Scott No 1169. 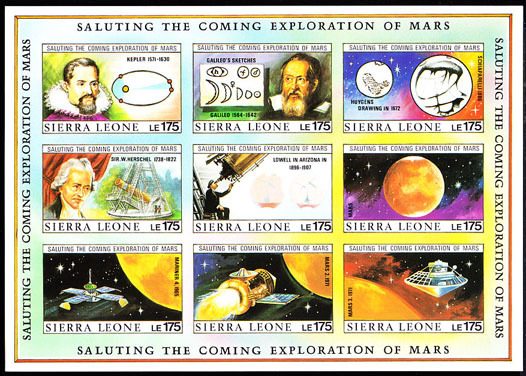 17287 ND SIERRA LEONE (1990) Saluting the coming exploration of Mars, sheet 4. Imperforate M/S of 9. Scott No 1170. 306 ND SIERRA LEONE (1992) Spanish paintings*. 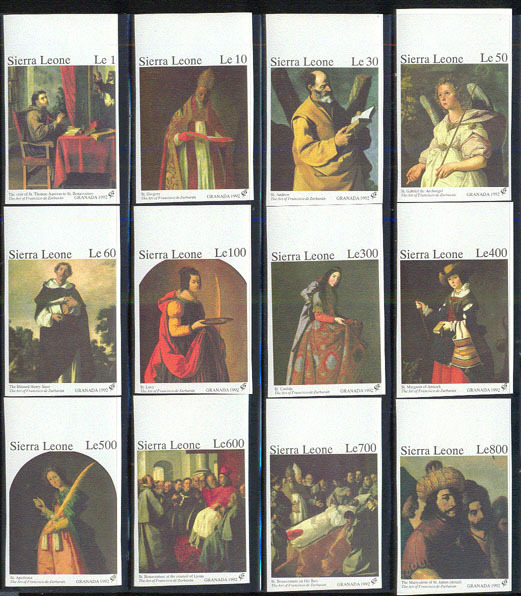 Complete set of 12 imperforates. Scott Nos 1487a-1495a. Only one sheet of 10 of each value was printed imperforate! 801 ND SIERRA LEONE (1993) Black Persian*. Imperforate. Scott No 1644a, Yvert No 1667. Only one sheet of 10 of each was printed imperforate! 802 ND SIERRA LEONE (1993) Blue-point Siamese*. Imperforate. Scott No 1644b, Yvert No 1668. Only one sheet of 10 of each was printed imperforate! 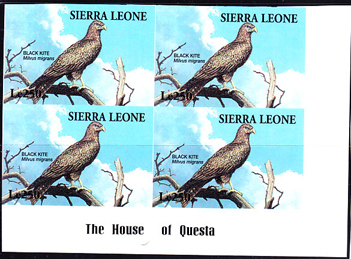 803 ND SIERRA LEONE (1993) American wirehair*. Imperforate. Scott No 1644c, Yvert No 1669. Only one sheet of 10 of each was printed imperforate! 804 ND SIERRA LEONE (1993) Birman*. Imperforate. Scott No 1644d, Yvert No 1670. Only one sheet of 10 of each was printed imperforate! 601 ND SIERRA LEONE (1994) Black kite (Milvus migrans)*. Imperforate. Scott No 1734. 602 ND SIERRA LEONE (1994) Superb sunbird (Nectarinia superba)*. Imperforate. Scott No 1735. 603 ND SIERRA LEONE (1994) Red bishop (Euplectes orix)*. Imperforate. Scott No 1737. 632 ND SIERRA LEONE (1994) Martial eagle (Polemaetus bellicosus)*. Imperforate. Scott No 1736. 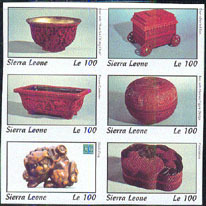 827 ND SIERRA LEONE (1994) Chinese pottery and artifacts*. Imperforate block of 6. Carved lacquer. Scott Nos 1716a-f, Yvert Nos 1763-8. Only one sheet of 10 of each block was printed imperforate! 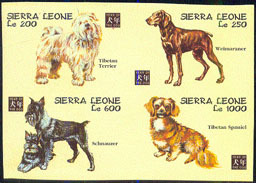 1059 ND SIERRA LEONE (1994) Dogs*. Imperforate block of 4. Year of the Dog. Scott Nos 1717c-f. Only one sheet of 10 of each block was printed imperforate! 1361 ND SIERRA LEONE (1994) Aerangis kotschyana*. Imperforate. Scott No 1741. Only one sheet of 10 imperforates was printed. 1362 ND SIERRA LEONE (1994) Brachycorythis kalbreyeri*. Imperforate. Scott No 1742. Only one sheet of 10 imperforates was printed. 1363 ND SIERRA LEONE (1994) Diaphananthe pellucida*. Imperforate. Scott No 1743. Only one sheet of 10 imperforates was printed. 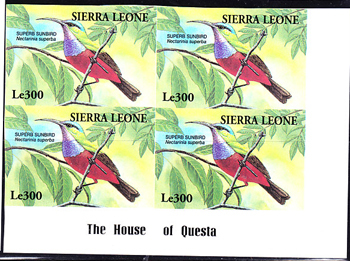 1364 ND SIERRA LEONE (1994) Eulophia guineensis*. Imperforate. Scott No 1744. Only one sheet of 10 imperforates was printed. 1366 ND SIERRA LEONE (1994) Tridactyle tridactylites*. Imperforate. Scott No 1746. Only one sheet of 10 imperforates was printed. 1367 ND SIERRA LEONE (1994) Cyrtorchis arcuata ssp. variabilis*. Imperforate. Scott No 1747. Only one sheet of 10 imperforates was printed. 3586 ND SIERRA LEONE (1994) Superb sunbird (Nectarinia superba). Imperforate corner block of 4. Scott No 1735. 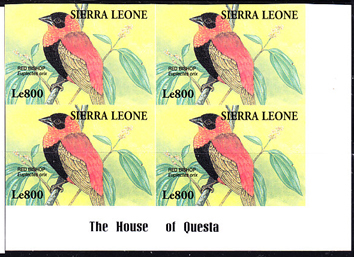 3587 ND SIERRA LEONE (1994) Red bishop (Euplectes orix). Imperforate corner block of 4. Scott No 1737. 3632 ND SIERRA LEONE (1994) Black kite (Milvus migrans). Imperforate corner block of 4. Scott No 1734. 3633 ND SIERRA LEONE (1994) Martial eagle (Polemaetus bellicosus). Imperforate corner block of 4. Scott No 1736. 308 ND SIERRA LEONE (1996) "Morning, An Overcast Day, Rouen" by Pisarro*. Imperforate. Scott No 1871a, Yvert No 2155. Only one sheet of 10 of each was printed imperforate! 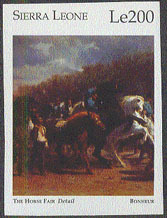 309 ND SIERRA LEONE (1996) "The Horse Fair" by Bonheur*. Imperforate. Scott No 1871b, Yvert No 2156. Only one sheet of 10 of each was printed imperforate! 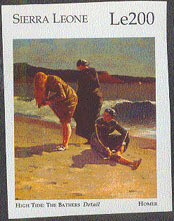 310 ND SIERRA LEONE (1996) "High Tide, The Bathers" by Homer*. Imperforate. Scott No 1871c, Yvert No 2157. Only one sheet of 10 of each was printed imperforate! 4026 ND SIERRA LEONE (1996) Turtle*. Japanese woman*. Imperforate S/S. 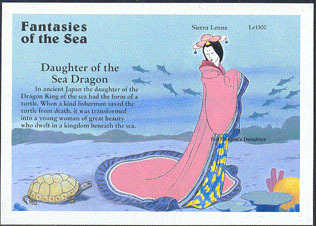 Fantasies of the Sea series - Daughter of the Sea Dragon (Japanese Legend). Scott No 1934. 4027 ND SIERRA LEONE (1996) Merman*. Imperforate S/S. 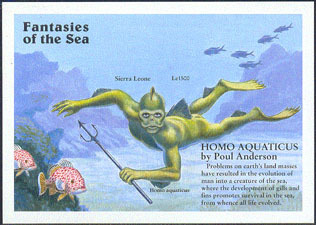 Fantasies of the Sea series - "Homo Aquaticus" by Poul Anderson. Scott No 1935. 4028 ND SIERRA LEONE (1996) Sea Fairy*. Seagulls*. Imperforate S/S. 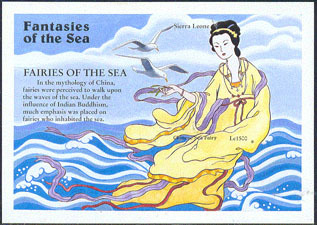 Fantasies of the Sea series - Chinese Buddhist legend. Scott No 1936. 4029 ND SIERRA LEONE (1996) Totem pole*. Imperforate S/S. 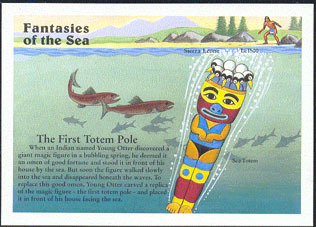 Fantasies of the Sea series - First totem pole. Scott No 1937. 4031 ND SIERRA LEONE (1996) Aphrodite*. Fish*. Corals*. Imperforate S/S. 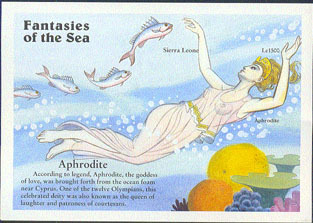 Fantasies of the Sea series - Legend of Aphrodite. Scott No 1942. 4032 ND SIERRA LEONE (1996) Ship's figurehead*. Imperforate S/S. 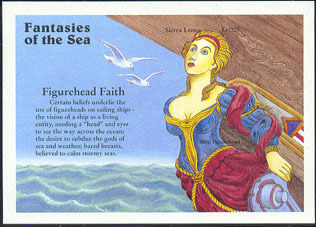 Fantasies of the Sea series - Figurehead Faith. Scott No 1943. 4033 ND SIERRA LEONE (1996) Lilith*. Fish*. Imperforate S/S. 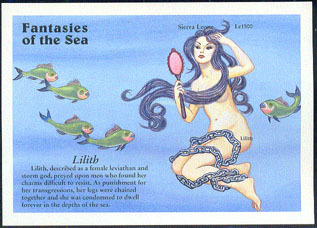 Fantasies of the Sea series - Legend of Lilith. Scott No 1944. 4034 ND SIERRA LEONE (1996) Odysseus*. Sirens*. Imperforate S/S. Fantasies of the Sea series - Odysseus tempted by the sirens. Scott No 1950. 4035 ND SIERRA LEONE (1996) Mermaid*. Sunken ship*. Man*. Imperforate S/S. 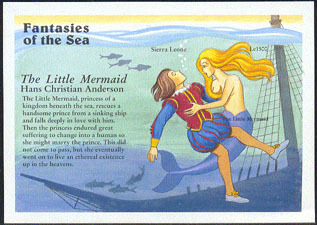 Fantasies of the Sea series - "The Little Mermaid" by Hans Christian Anderson. Scott No 1951. 4036 ND SIERRA LEONE (1996) Airship*. Modernistic buildings*. Imperforate S/S. 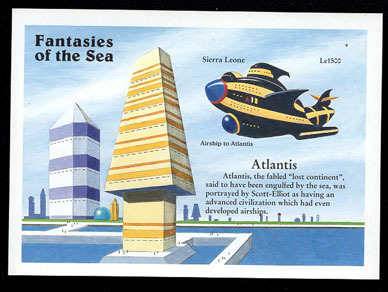 Fantasies of the Sea series - Atlantis. Scott No 1954. 4037 ND SIERRA LEONE (1996) Sea bishop*. Imperforate S/S. 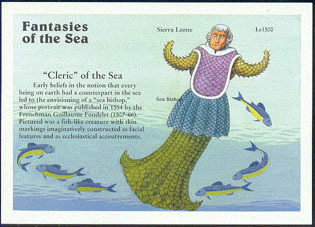 Fantasies of the Sea series - Early French legend. Scott No 1955. 4038 ND SIERRA LEONE (1996) Submarine*. Men in diving helmets and suits*. Imperforate S/S. 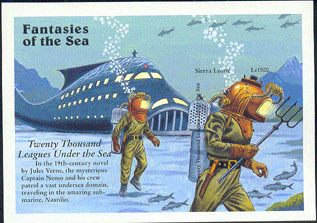 Fantasies of the Sea series - "Twenty Thousand Leagues Under the Sea" by Jules Verne. Scott No 1956. 4039 ND SIERRA LEONE (1996) Man riding horse* underwater*. Imperforate S/S. 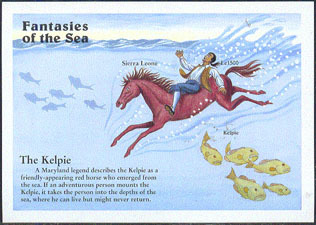 Fantasies of the Sea series - The Kelpie (Celtic legend). Scott No 1960. 4040 ND SIERRA LEONE (1996) Indian* riding sea lion*. Imperforate S/S. 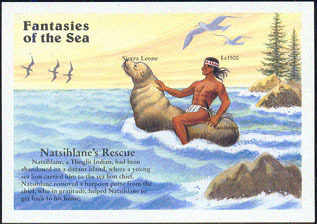 Fantasies of the Sea series - Natsihlane's Rescue (Tlinglit legend). Scott No 1961. 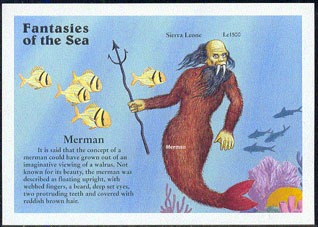 4041 ND SIERRA LEONE (1996) Merman*. Imperforate S/S. Fantasies of the Sea series. Scott No 1962. 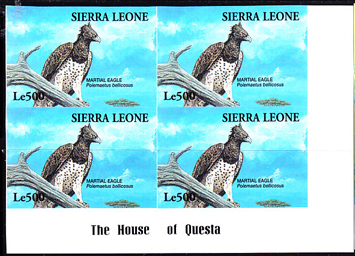 4042 ND SIERRA LEONE (1996) Albatross*. Imperforate S/S. Fantasies of the Sea series. Scott No 1963. 4043 ND SIERRA LEONE (1996) Hippocampus*. 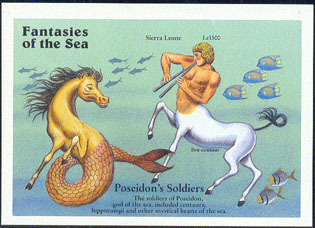 Sea centaur playing flute*. Imperforate S/S. Fantasies of the Sea series - Poseidon's Soldiers. Scott No 1967. 4044 ND SIERRA LEONE (1996) Sea dragon*. Imperforate S/S. 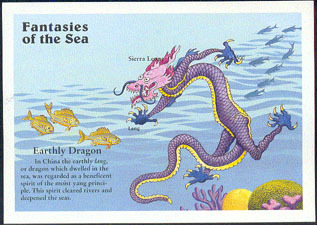 Fantasies of the Sea series - Chinese legend. Scott No 1968. 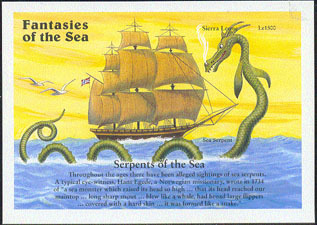 4045 ND SIERRA LEONE (1996) Sea serpent* attacking sailing ship*. Imperforate S/S. Fantasies of the Sea series - Serpents of the Sea. Scott No 1970. 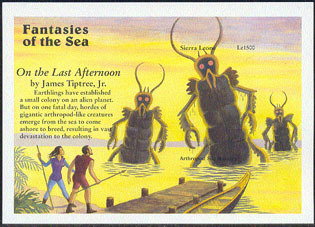 4046 ND SIERRA LEONE (1996) Giant arthropods emerging from the sea*. Imperforate S/S. Fantasies of the Sea series - "On the Last Afternoon" by James Tiptree. Scott No 1971. 4047 ND SIERRA LEONE (1996) Seaman at helm*. Imperforate S/S. 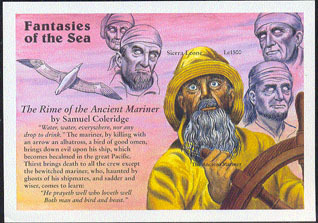 Fantasies of the Sea series - "The Rime of the Ancient Mariner" by Samuel Coleridge. Scott No 1972. 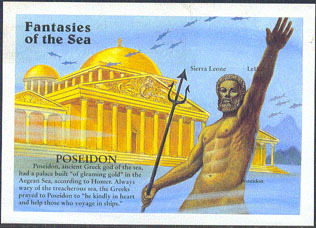 4048 ND SIERRA LEONE (1996) Poseidon*. Greek temple*. Imperforate S/S. 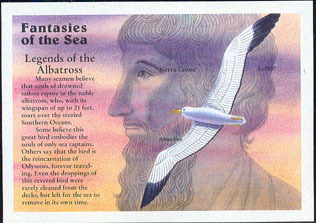 Fantasies of the Sea series - Legend of Poseidon. Scott No 1973. 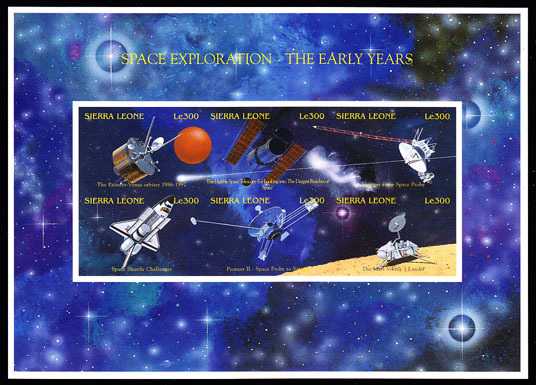 17303 ND SIERRA LEONE (1996) Space exploration, the early years. Imperforate M/S of 6. Scott No 1904. 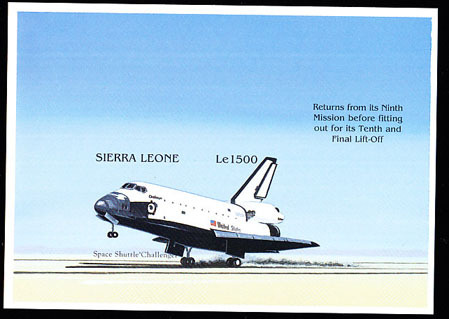 17304 ND SIERRA LEONE (1996) Space shuttle. Imperforate S/S. Scott No 1905. 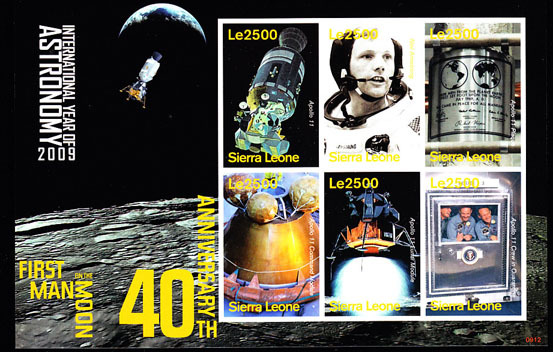 17364 ND SIERRA LEONE (2009) 40th anniversary of first moon landing. Imperforate M/S of 6. Scott No 2946.